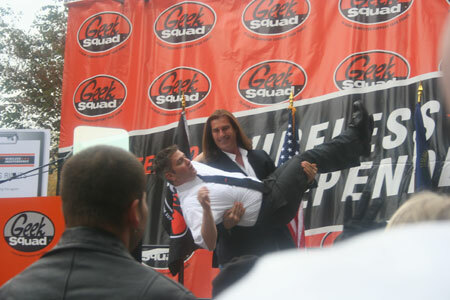 As promised earlier today, I interviewed Fabio at the Geek Squad event yesterday. Here's some highlights. •Fabio likes his Macs. He uses Final Cut Pro to edit video he does for TV, but is using a G4. WTF? He'll spring for a MacPro soon, though, he assured me. •The dude is an old school gadget geek; he used to own an Amiga. Can you picture him tinkering away on an Amiga? •He's got a ridiculous A/V system, complete with 15 ft. x 7 ft. screen, powered by a Ronco HD projector. He's also keen on Krell. •He's not a fan of either HD DVD or Blu-ray. •He called the Xbox 360 "incredible." He's not really a fan of today's video games, however, but is completely blown away by the graphics. Then he went off on some weird tangent about how he and Hulk Hogan were the first real people on the cover of a video game box. Now, what you've all been waiting for... hot Fabio pics! 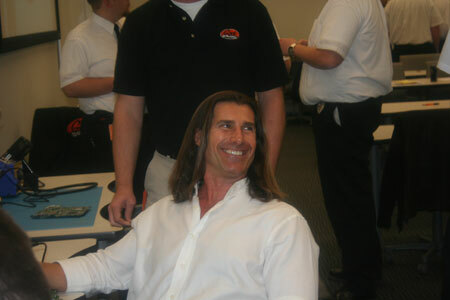 So be sure to tell your friends that today you learned that Fabio is a big nerd, just like you.